I know, it’s been a while…I didn’t get around to posting anything all summer. And now, I can’t believe it’s already October and everyone’s talking about plans for the upcoming Thanksgiving weekend! 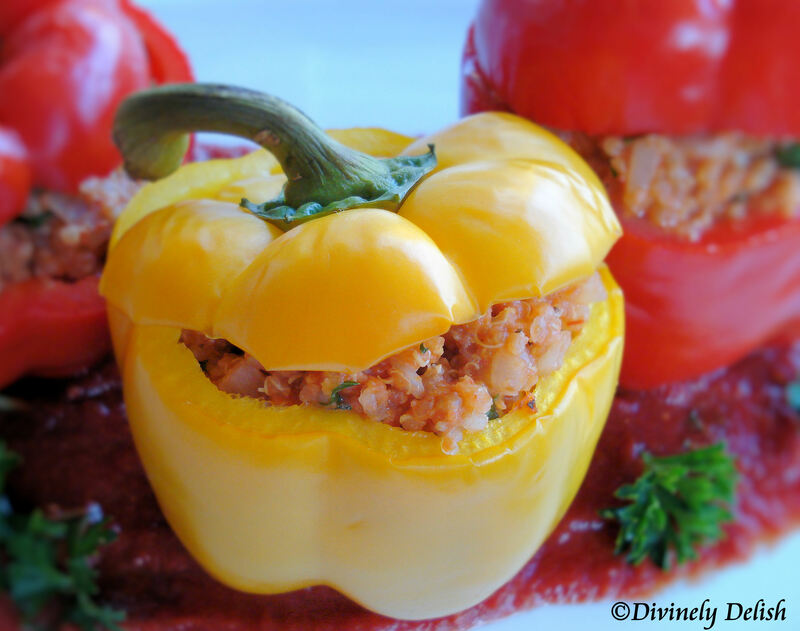 I’d like to finally share with you a wonderful, surprisingly easy recipe for stuffed bell peppers that I made during the summer. The original recipe called for white rice, but I decided to substitute quinoa instead, to make a tasty, healthier (protein-packed) version. Using yellow, red and orange peppers gives this dish a lovely burst of colours. Sweet bell peppers are especially nice for serving up during the summer and fall, when they are juicy, crisp and full of flavour. 1) Preheat oven to 400 F (200 C). 2) In large skillet heat oil over medium heat. Add onion, garlic, and green pepper and sauté until soft, 4 to 5 minutes. Increase heat to medium-high and add chorizo, breaking up meat and cooking 3 to 4 minutes. Add tomatoes and red chili flakes and simmer until thickened, about 15 minutes. Transfer to large bowl and set aside to cool. 3) In another bowl mix rice, cheese, eggs, bread crumbs, oregano and parsley. Add to cooled chorizo sauce and mix well. Season with salt and pepper to cool. 4) Slice tops off peppers, about ½-in (1 cm), reserving them. Leaving peppers whole, core and seed them. 5) Divide mixture among peppers, stuffing lightly and mounding filling just past tops. Top with reserved pepper tops and transfer to baking dish. Cover with lid or aluminum foil and bake 50 to 60 minutes, or until peppers are tender. Remove lid or foil for last 10 minutes to brown. 6) When ready to serve, heat up tomato sauce and ladle around peppers. Serve immediately and garnish with chopped Italian parsley. Sometimes I like to stuff my pepper with another stuffed pepper.